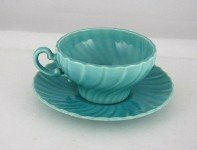 Franciscan dinnerware hit the market in 1935 under the tradename "Franciscan Pottery", a division of Gladding, McBean and Company who operated in California. Within four years, they were producing around fifteen patterns of dinnerware. In the 1930, the dinnerware line was referred to as "Franciscan Ware". The design of hand-painted, embossed dinnerware began around 1940. 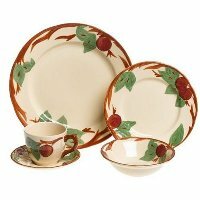 The two most popular Franciscan patterns are Franciscan Apple (introduced in 1940) and Franciscan Desert Rose dinnerware (introduced in 1941). Although the company has gone through many changes, including a merger and a buy out of the Franciscan line, these two patterns are still in production. Other renowned Franciscan hand-painted patterns among collectors include Fresh Fruit, Ivy, October, and Wildflower. 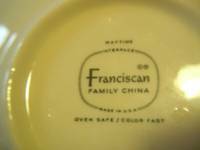 In 1979, an English dinnerware company, Josiah Wedgwood & Sons, LTD, acquired the Franciscan line and changed the name to Franciscan Ceramics, Inc. Since 2000, the Franciscan patterns are manufactured around the world by Johnson Brothers/Franciscan - part of the Wedgwood Group. If you intend to collect Franciscan tableware, I suggest that you do some studying of it. Although the patterns are similar they are produced at different plants and the pattern varies somewhat. For instance, the Desert Rose pattern has been produced in America, England and China. 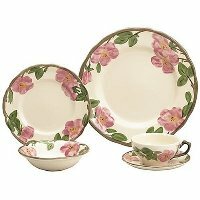 The original American dinnerware version has pale pink flowers and they are brighter in the English dinnerware pattern. Just because it is Franciscan Desert Rose, that doesn't mean that the pieces will match your set. The secret to collecting Franciscan patterns is to get familiar with the back stamp. 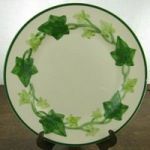 You will find loads of Franciscan patterns when searching vintage dinnerware. Many patterns have been produced under the Franciscan name since the 1930s.